When I was booking my flights home for winter break, my mom suggested that I stop over in Melbourne for a couple days on the way back. (This was definitely her suggestion and not mine, because I'd already felt like a spoilt child for being allowed to come home this break.) I took to the idea at once, as a) I had never been to Melbourne, b) I have some Internet friends in Melbourne, and c) I have some primary school friends in Melbourne. After confirming my bookings, I contacted the people involved in reasons b) and c) to ensure that there would still be reasons b) and c) to be excited. I was particularly excited about reason b). Leaving Malaysia was a bit of a bummer, because that meant the holidays were almost over. Also, it was nice to be at home and with my family again. As I packed, I was extra-glad for Melbourne, because going back to cold, dark Tassie to begin mugging again was not a very appealing thought. 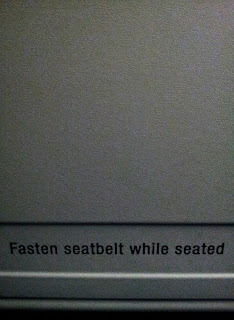 On the plane ride to Melbourne, I began to worry about reason b). I was definitely excited to meet my Internet friends, but I got more and more nervous the more I thought about it. There was no doubt in my mind that they were real people who were who they said they were (and not, as my father thought, '50-year-old, hairy truckers'), but other thoughts like 'What if we don't get along irl?' and 'What if they turn out to be really cool and realise that I'm really not and it's really awkward and we never speak again?' haunted me. But, you know, worrying about something doesn't stop it from happening, so it happened. Melbourne, I mean. Melbourne happened. The moment I stepped out of the airport, my spirits lifted. It was a quarter to midnight, and the air was wonderfully clean and crisp. I caught the midnight Skybus to Southern Cross station, gazing appreciatively at the city lights as we sped down the highway; it felt like home, but better, because home doesn't have that light chill in the air at night that I love. Also, city lights is one of my favourite things in the world. (I designed the layout of this blog more than three years ago, and it was based off that.) When we got into the city proper, I saw my first tram and freaked out a bit because I'd been expecting something quaint-looking and maybe slightly rickety, but was instead faced with what looked like the lovechild of a bus and an LRT. Weird. But cool. We got to Southern Cross, and my spirits sank a little again. The very thing that I had just been admiring about Melbourne on the bus -- how big all the buildings were -- was now acting to my disadvantage. 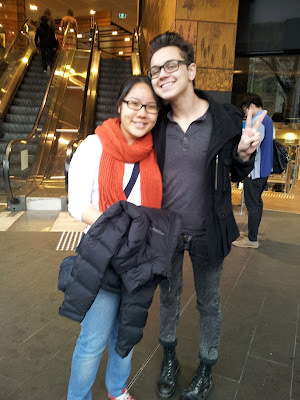 Ryan and I had agreed to meet at Southern Cross station, but not where in Southern Cross station. As I plodded along with my luggage, trying to locate where the trams were, I figured that this was probably the equivalent of KL Sentral back home. Anyway, I stumbled upon a Hungry Jack's, told Ryan where I was, and he and two of his friends came to get me. I just realised KL Sentral has a Burger King, so the comparison was more accurate that I thought. We walked over to Bourke Street to catch a tram (which pretty much felt like being on an LRT, except the little bell sound the tram makes is cuter) and walked the rest of the way to Ryan's place. I was to be staying in Sara's room since she was back in Malaysia, so I got myself settled down in there. She'd practically guaranteed that her room was smaller than mine in Jane, and of course I didn't believe her because Jane has notoriously small rooms, but she turned out to be right. Rental here is so much higher than in Tassie, too. Melbourne, you cray cray. The next morning, Ryan brought me out for brunch at Manchester Press. We had to go down this alley to get in, which seemed really dodgy to me, but I guess it's a testament to its bagels and coffee that they don't need a big sign or proper storefront to be so popular. 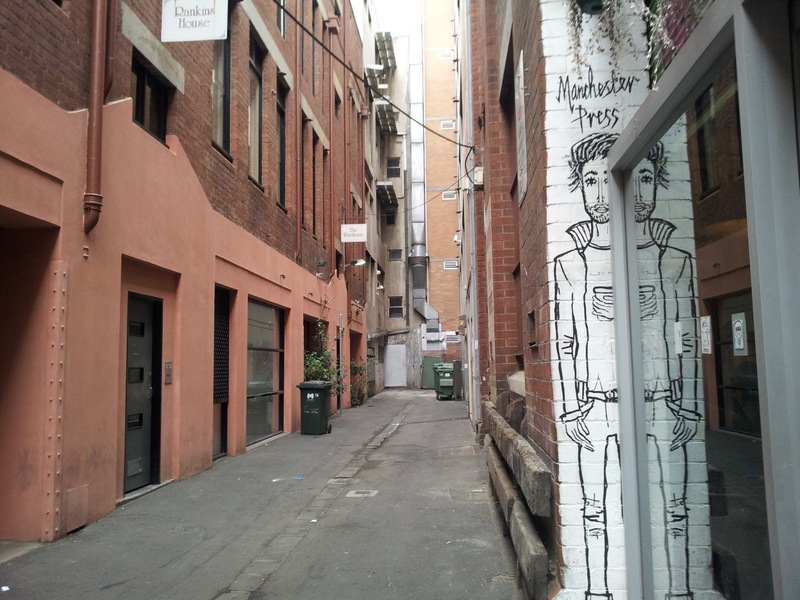 (I did a bit of reading, and apparently the alleyway bit is a thing in Melbourne. 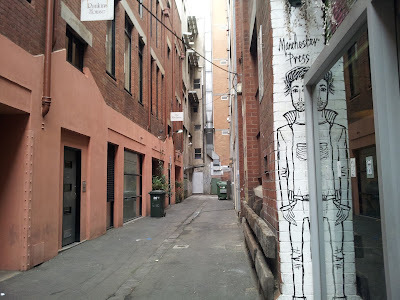 Places like this are called 'laneway cafes'.) We had to wait a little bit outside, and I thought it was cute how the waiter wrote the names of the people in line on the brick doorway using a piece of chalk, rubbing the names off as the people they belonged to were seated. I had a wholemeal bagel with avocado, feta, chilli & mint with cherry tomatoes, roquette & pine nuts; I tasted no mint and it was probably the least spicy thing I have eaten in my life, but it was goooooood. So was the flat white I ordered. Yum. To be honest, I get the feeling that I could get a flat white anywhere in Melbourne and it would be good, but Ryan says this isn't so. Attention hipster friends: This is the place to go. 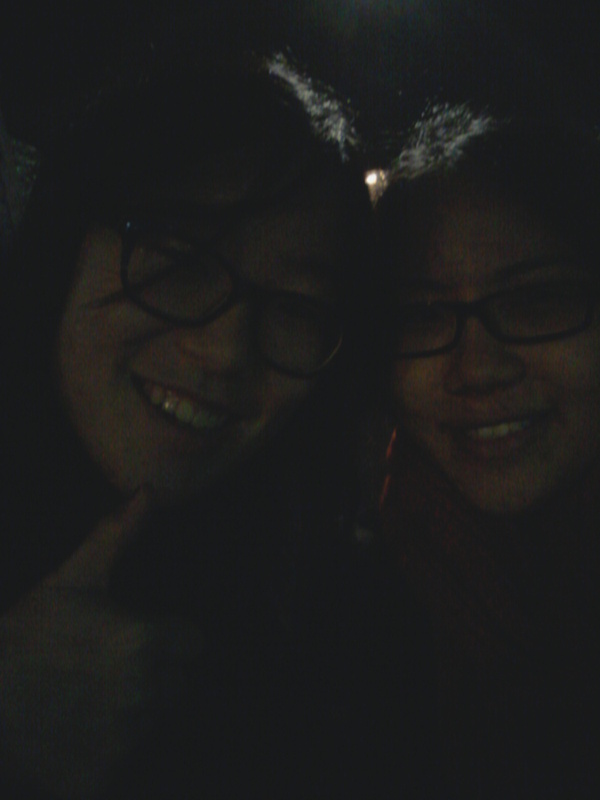 After we were done, we went to Queen Victoria Market. I was amazed at how big it was. 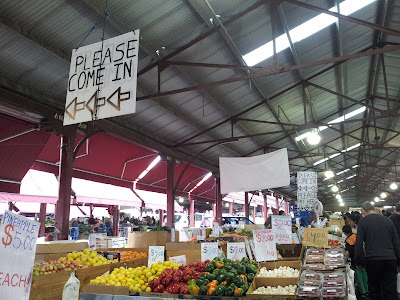 There was one building just for pastries, other edibles, and raw meat and seafood; there were two large, covered areas for fruit and vegetables alone; and I don't even know how many large, covered areas there were for clothes, souvenirs, and the like. It reminded me a lot of Thailand and Hong Kong, really. 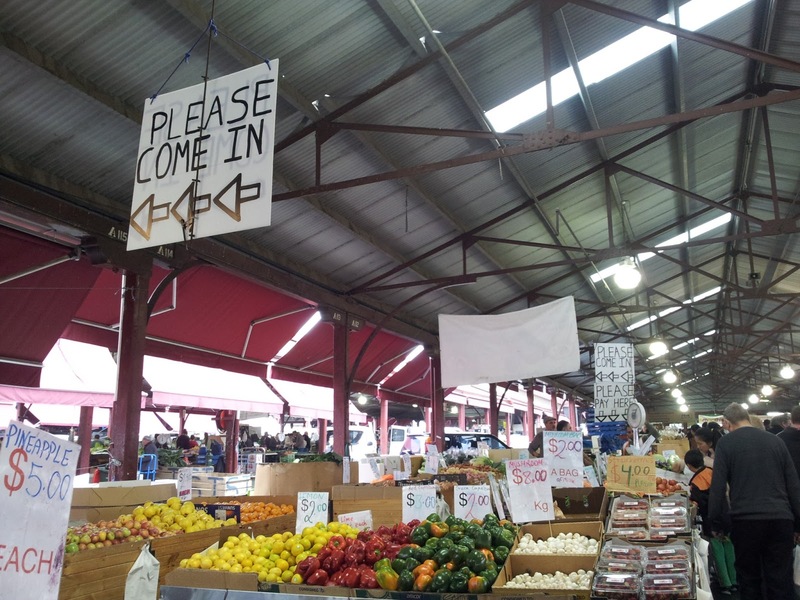 I thought it might've been just one giant tourist trap, but locals actually go there to get fresh meat and produce and stuff. All the stuff looked really good. You have to wonder how everyone gets business if there are so many stalls under one roof (and under other roofs) selling the same things. Anyway, I can't remember everything we talked about because we talked about a lot of stuff, but I do remember telling them about Manchester Press, and Emma (who's from Melbourne, whereas Mikey's from Perth) saying something along the lines of, "That's what I love about Melbourne: you go down an alley and you can either get a drunk guy with a knife or a cafe." Which I suppose some might say sums up Melbourne. I cannot tell you how adorable Mikey is. Then later that night, I met Sharona and her boyfriend Aidan! (Yeah, I know, I see a pattern too.) I somehow managed to walk for quite a bit in the opposite direction of where I was supposed to go, but it was okay because she was stuck in traffic so we were both late. It was raining, and Melbourne rain, unlike Tassie rain, is actual rain, not just this constant sprinkling of tiny water droplets. I made it to her place fairly dry thanks to Ryan's umbrella, she picked me up from there after work, and the three of us headed to Lentil As Anything. It's this cool, hippie-ish, buffet-style place that's 'pay as you feel'; everything's vegetarian and almost everything is vegan. Unfortunately, it was pretty packed tonight, but we managed to get seats in the end! Tonight's theme was Greek, and the food was pretty good, but I couldn't eat much because I was nervous. Sharona kept asking if I wanted more food, but I kept declining, and I felt bad each time it happened, but I couldn't very well say "Sorry, I don't have much of an appetite right now because I'm still kind of nervous around you and Aidan even though I'm not supposed to be nervous around you since we're known each other since we were like fourteen." But now, since this is the Internet, I can, so there you go, Sharona. Sorry! But I'm really, really glad we got to meet up, because this is literally something we've been talking about for years. I think there was some mutual awkwardness, but I could tell that, like Mikey, she's pretty much the same person she is online, so, again, that was a relief. She's just really nice, and tonight was good; hopefully now that the first face-to-face meeting has happened, the next will be better. is not a 50-year-old, hairy trucker. The person on the right, I'm not so sure. 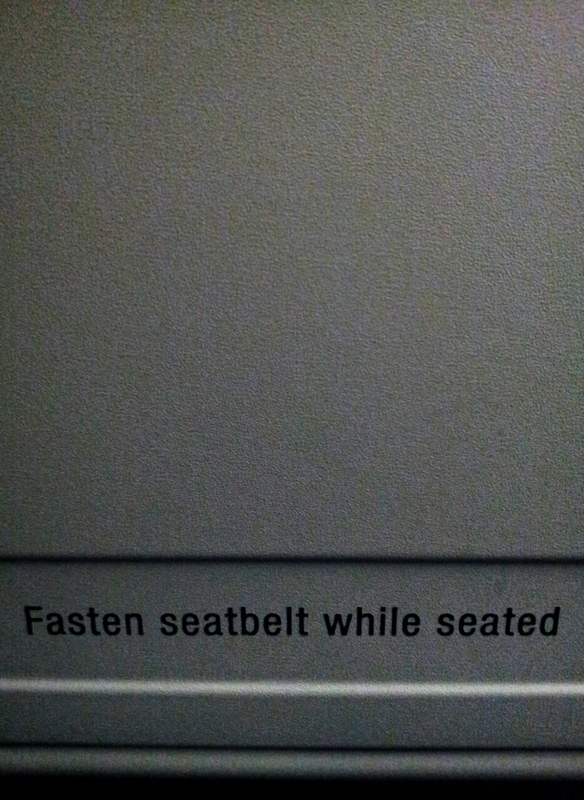 And there will be a next, because I really like Melbourne. I've only spent a day here, but I really, really, really like Melbourne. I like the cityness that Hobart sorely lacks. I like the trams. I like the buskers every few blocks, and the fact that I have not come across a single bad busker (Sharona said she thinks you actually have to audition to busk on Bourke Street). I like the little cafes everywhere. I like how there're so many different cuisines available. I like the tall buildings. I like the wide roads. 'Culture' and 'city' are probably the two most cliche words to describe Melbourne, but those are the two things about the place that really draw me in. Tomorrow I'll be meeting up with some primary school friends, so it should be good. I was hoping to stop by Max Brenner Chocolate Bar first (darn you, Ryan -- all your Instagram photos! ), but that might not be possible, seeing as how it's now 4am. Writing this post took quite a while. But anyway, I am going to go to bed now and make the most of my final hours in Melbourne tomorrow. Goodnight!